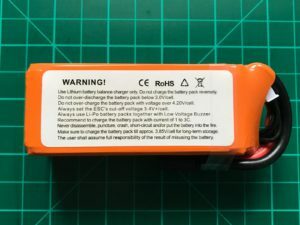 After reviewing the great Dinogy Graphene 2.0 packs, the time has finally come and I received samples of the newest battery product from Dinogy. 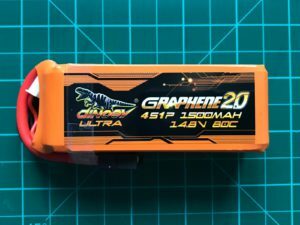 This review is looking at the 1500 mAh version of the all new Dinogy Ultra Graphene 2.0 4S 80 C pack. The new Dinogy Ultra family* not only rates up to 80 C (instead of 70 C), it also comes in a superb looking orange shrink wrapping. I am very happy to see though, that they decided to continue using the cool looking, now bright yellow, honey comb-style materials on the sides. On the back you find a sticker that provides all the important information how to handle the battery. I still really appreciate to see this stuff printed onto the pack. A lot better than giving out a small piece of paper as many other manufacturers tend to do. The packs come in a high quality card box. The pack itself is packed in bubble wrap. 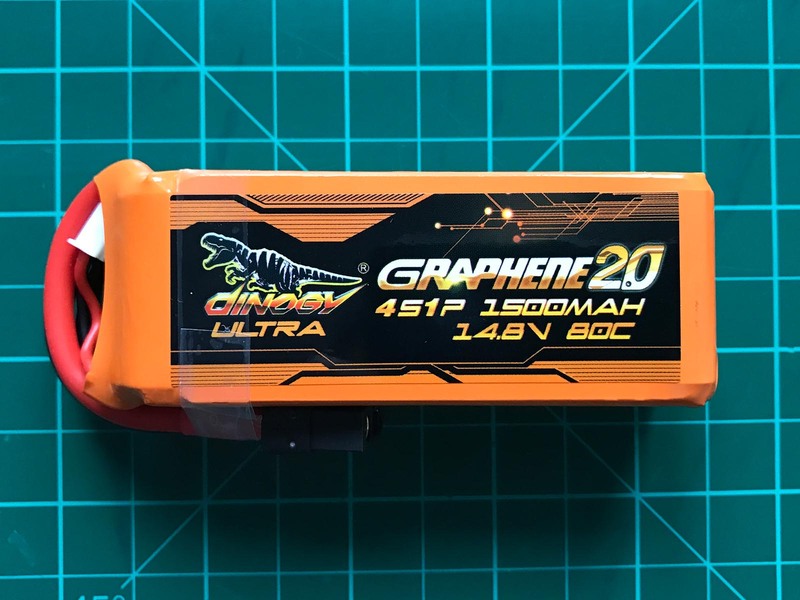 The Dinogy Ultra Graphene 2.0 80 C pack* is a standard 4S1P config flight pack for high power use. It utilizes the new generation graphene cell chemistry. An extra layer of carbon particles is added to minimize internal resistance and hence maximize possible current draw. The newest version now is rated up to 80 C constant. We will see about that later. Build Quality: Very good. Pack feels very well made on the outside. Connection terminal looks solid. The bright yello honey-comb material feels like it offers good protection on the sides. The orange coloring looks pretty flashy, too – I like it. The golden sticker at the bottom adds to the overall quality feel of the product. Cables: L&E uses 12 AWG wires on this packs. The high flexible silicon layer is rated up to 200°C. Cable length is about 7.5 centimeters. CV-Phase is very short on this cell type. Balancing in normal mode took 1:10 min. Cell drift during charge was unobtrusive. This is for 1C charge (1,5 A). 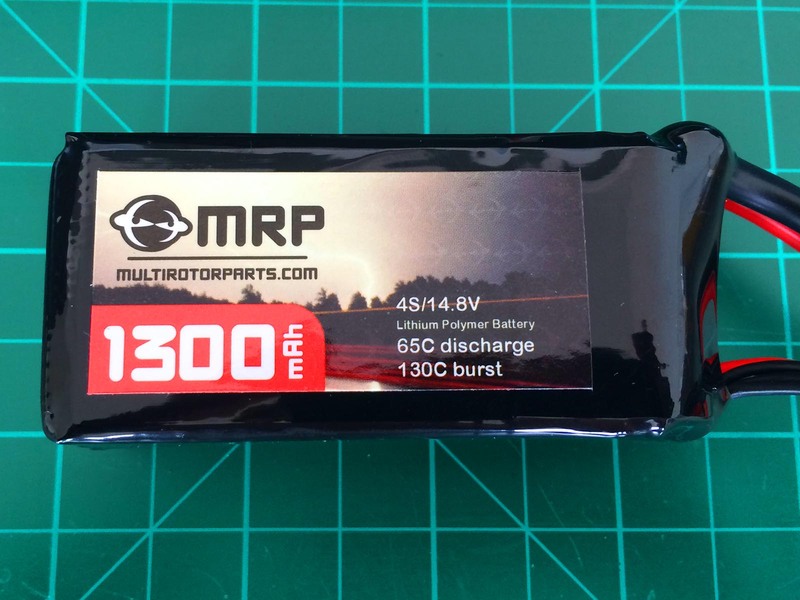 During this test the pack delivered 1132 mAh. This is 75,5 % of nominal capacity. A very good result. 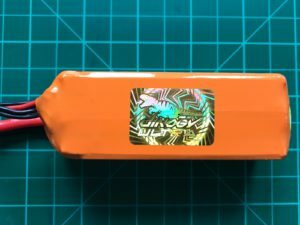 Voltage sag is very low on the Dinogy Ultra 1500 mAh pack. No cell went below 3,5 V/cell benchmark on first two load cycles. 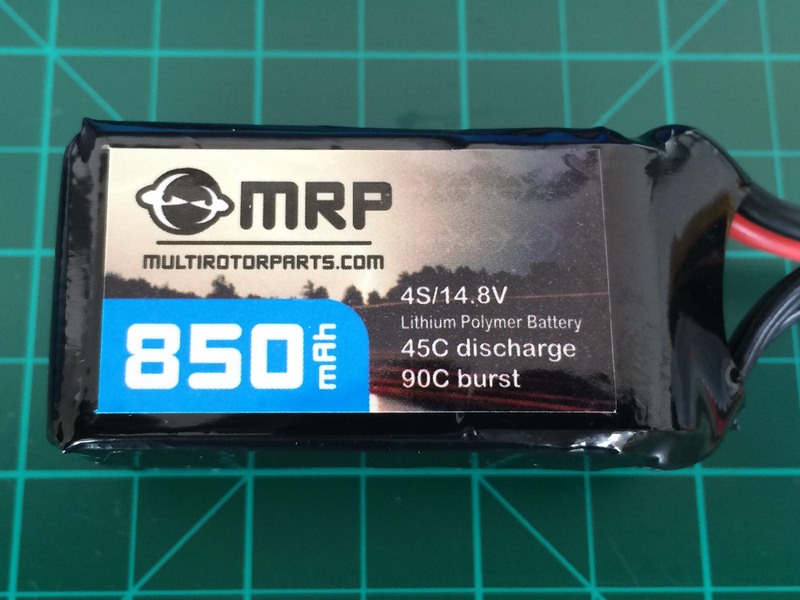 Voltage recovery is quick for the new Graphene 2.0 1500 mAh 80 C battery*. Interpretation: The internal resistance of 2.08 mΩ average per cell indicates a „true“ C-rating of around 44 C (65.8 A). This is on the conservative side and represents a current draw that will make the pack last for a long time. Looking at cell one it becomes visible that matching on this cell is a little off. It clearly is the weakest cell within this pack. Still overall performance can be described as very high. Cell drift is very low on the new Dinogy Graphene 2.0 80 C* packs during main discharge phase. Cell 1 is visible weaker to the end of the discharge cycle and creates the drift difference at the very end of the test. Cut-Off /warning value for this battery should be chosen 3.5 V minimum. After this point voltage drops quick. The battery provided 1141 mAh (76,1 %) during the 25 C discharge. One of the best results so far. 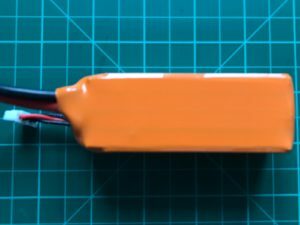 During the test of pattern 1 the pack delivered 1154 mAh. This is 76.9 % of nominal capacity. Very good. In patter 2 testing 1124 mAh (74.9 %) could be used until first cell reached cut-off voltage. The all new Dinogy Ultra Graphene 2.0 4S 1500 mAh 80C battery* is a usual sized pack with a capacity to weight ratio of 7.35 mAh/g. As other graphene enabled packs this battery tends to be heavier than a „standard“ lipo. 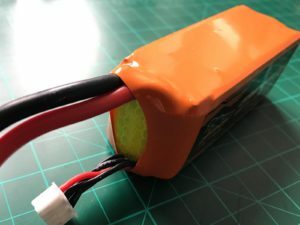 Build quality of this battery is excellent. The pack is rectangular shaped and keeps it shape under every load situation. No puffing what so ever! I personally like the fresh design combining the orange with the bright yellow honey-comb reflector materials at the sides. Looks even better than the predecessor’s light-grey to red coloring. Voltage stability is great on the Graphene 2.0 80C version. Cut-off should be chosen at 3,45 V/cell at the very minimum. The sticker on the pack tells you 3,4 V/ cell but this would mean to cut of throttle immediately after you hear your telemetry or buzzer complaining. Usable battery capacity is one of the best of all packs testes within the 1500 mAh class so far. Cell matching still can be improved as one cell (cell one) is noticeably weaker than the rest to the end of discharge cycle. The rating of 80C is a bit over the top, of course. I would rate this pack at very astonishing 44 C continuous, though. This allows you to pull around 65.8 A without having to worry about the packs health too much. 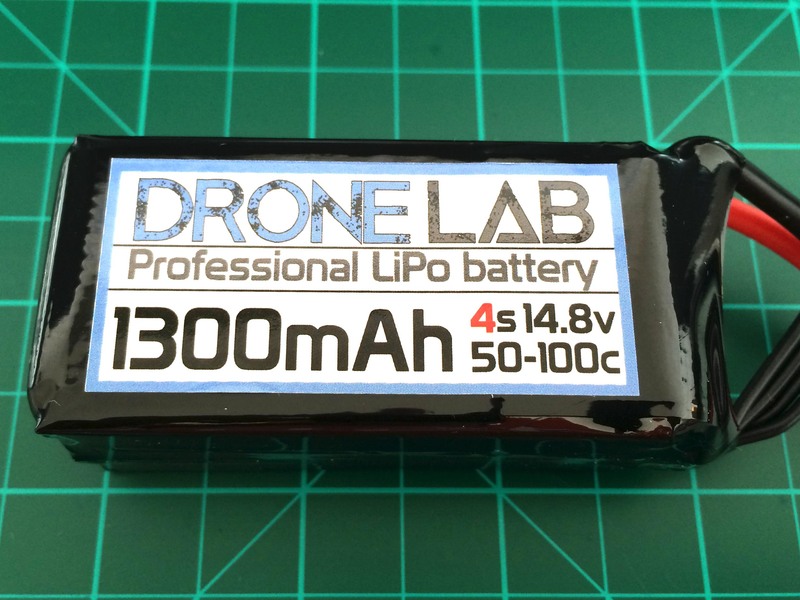 More than enough head room for most of the applications out there and the best result in the 1500 mAh class so far. As you can see in the dynamic loads higher current spikes are handled well. Punch out out time! For around 40 US-$ this pack is certainly not the cheapest battery you can buy. 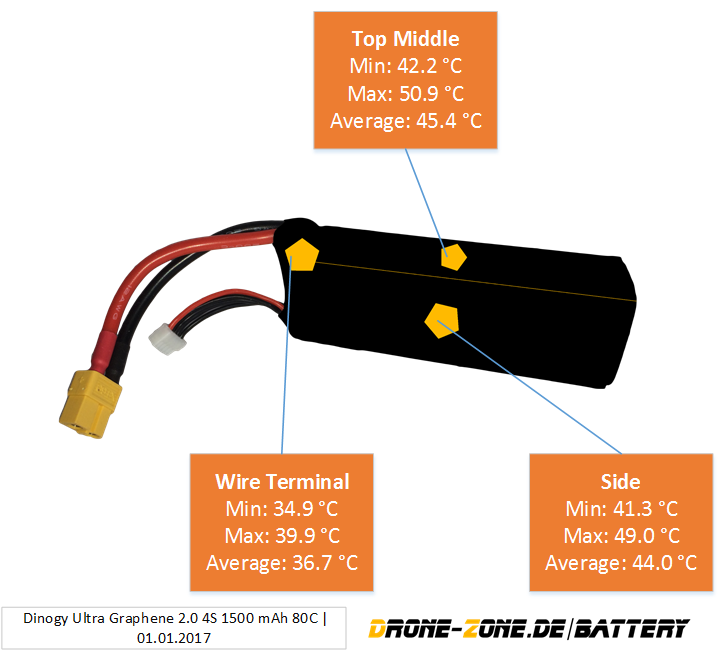 On the other hand the Dinogy Ultra Graphene 2.0 80 C 1500 mAh* version is one of the best batteries in this class I have reviewed so far. That’s not only true for performance, but also for overall product quality. It outperforms the already great Dinogy* Graphene 2.0 70C version without any question. In the end 40 dollars are still a very good deal for this pack if you are certain to utilize the potential.